The existence of Israel as a legitimate state is now being challenged in a number of ways and by a variety of media: by a Palestinian-initiated offensive to portray Palestinians as suffering from human rights abuses and colonial crimes committed by Israel; by the Electronic Intifada, an online Internet news website; by the United Methodist Kairos Response; by individuals and groups, such as the writers and academics Grace Halsell, Timothy Weber, Tony Campolo, and Gary Burge, (Wheaton College), as well as attendees, especially Stephen Sizer, the anti-Zionist Church of England priest, at the Christ at the Checkpoint Conferences organized by the Bethlehem Bible College. 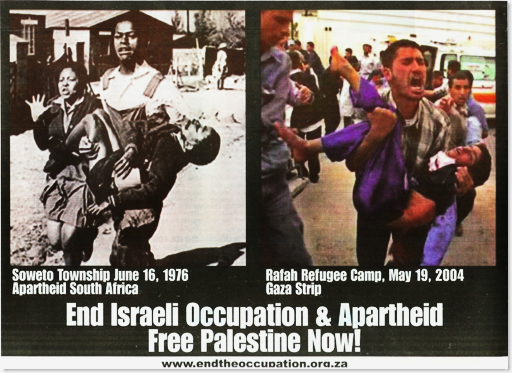 of occasions, has put paid to the lie spread by the Palestinian narrative, that Israel is an apartheid state. At the international conference of legislators from around the world held in Budapest on October 31, 2011, Pastor Meshoe replied to the kind of fulminations published by the Electronic Intifada that Israeli actions are "the epitome of apartheid" and aim at the systematic destruction of Palestinian society. He describes those who promulgate the lie of Israel-as-apartheid as ignorant individuals who are not aware of, or who deliberately disregard, the true nature of the negative impact of apartheid on black South Africans -- an experience quite different from that of Palestinians in nature and intensity. South African blacks were treated as second-class citizens and were denied basic human rights. By contrast, he points out that in Israel there are no laws discriminating against people on the basis of their color or on the basis of their religion. Palestinians have not suffered the pain of apartheid experienced by black South Africans. Esther Meshoe, daughter of conservative South African parliamentarian, Dr. Kenneth Meshoe, refutes false allegations of apartheidism on the part of Israel. Mrs. Lydia Meshoe, wife of 19-year South African Parliamentarian Dr. Kenneth Meshoe, relates that reality of Muslim treatment by Israel nowhere approaches the false allegations of apartheid by South African politicians, seeking to curry favor with Muslim interests. She feels compelled, as a Christian, to stand up against this treachery against G-d's home and guardians. 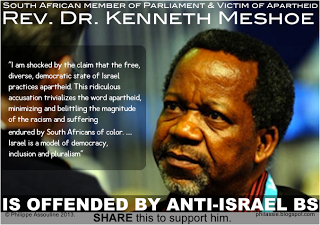 Dr. Kenneth Meshoe, 19-year member of South African Parliament, says that Islamist propagandas exploiting 'apartheidist' to mis-characterize Israel's treatment of Arabs- actually harms humanitarian growth in Africa by inhibiting African access to Israeli innovation in health, biology, environment, and energy. Cameroonian journalist, Stephen Mugwa Tebid, explains how overcoming negative beliefs about Israel could be more beneficial to Africa than solutions from the West. Mr. Tebid spoke at the Celebrate Israel Parade on June 2, 2013. He is presently in Israel to enhance relations with Africa. The Meshoe Family, Dr. Kenneth, wife, Lydia, and daughter Esther fleshed-out the situation in South Africa, their attitudes towards the lies of apartheid, and the burden they assume because of their commitment to defending Israel. They addressed an audience in Los Angeles on 11 Aug 2013, organized by Lily Steiner and Pastor Kevin Diekelman of One-Heart for Jerusalem.